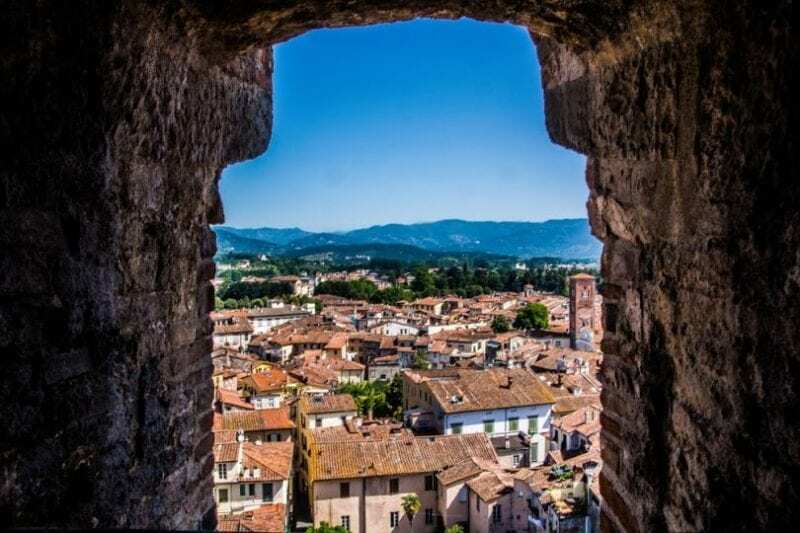 Lucca sits on the River Serchio and is famous for its very well preserved Renaissance period city walls. The city has a long and interesting history, including having being invaded and conquered by Napolean in 1805. After Napolean invaded, he made his sister, Elise, the Queen. I could think of worse places to rule tbh. Lucca spent a lot of time as an independent republic until it was eventually joined with the rest of Italy in 1861. It has a typically Tuscan in look and feel. After spending an evening, sitting on my deck on the outskirts of Pisa, we hatched a plan to hop a train the following morning and check it out. Lucca is pretty compact, making it very easy to walk around. The train station is a location just a short walk from the city walls and outside. If you need a coffee fix there’s a gorgeous little cafe in the town square where you can indulge before you get started. The walls surround the city and are in exceptional condition. Unusually for the region, the walls have remained in place despite the growth of the city. The walls serve as a reminder of the fortification of Lucca and are now much used to walk through, either above or beneath to allow access to the centre within. Once you work out how to access the little underpasses and pathways through the walls, you’ll be fine. My first foray was through a dark passage, up some stairs, down some stairs, and then out into the early morning sunshine right next to the Lucca Cathedral. It’s difficult to ask for a better view to emerge to. The Guinigi is the most important tower in Lucca and was donated to the people by the descendants of the family of the same name. The tower stands proudly in typical Romanesque style in the centre of the city and dates back to the 1300s. The tower, standing at more than 44 metres high, is located on the Via San Andrea and is one of the last remaining towers in the city and is instantly recognisable by the fact that it has a several-hundred-year-old oak tree growing on its roof. Standard. The roof terrace was previously used as a kitchen garden and is also open to the general public of a small fee. You can ascend several flights of stairs, followed by a very narrow steel staircase – which might give you pause for a few seconds – but eventually leads you out on the glorious roof terrace. It is quite a tight space, which requires visitors to all work together in the same direction in order to make it around the four walls, but it’s worth the wait as the views it offers across the gloriously terracotta coloured Tuscan rooftops are unrivalled. St. Martin’s Cathedral was closed during our visit; mainly because we arrived at such an unreasonably early hour and the Italians are clearly more intelligent. It did open later in the morning, you know…when normal tourists were arriving. The Gothic architecture of the marble Cathedral is stunning. Comprising three archways to the front, which are decorated above with a range of fabulous sculptures. Within the Cathedral, there are various tombs and wonderful frescoes by some of the finest artists in Italy. These include Domenico Ghirlandaio and Fre Bartolomeo. Other works by these artists are housed within the walls of the world-renowned Uffizi Gallery in Florence. There’s also a crucifix in the Cathedral on which appeared the Volto Santo (Holy Face). This led to the original church being demolished, making way for the enormous building that stands there today. The Volto Santo is one of Lucca’s many priceless treasures and there are many different legends as to its origins. The Holy Face takes pride of place within the Cathedral, where it’s been since AD742. Quite a long time, then. The piazza gets its name from the fact that is started life as an amphitheatre. The second you emerge from one of the four gateway entrance into the piazza, its oval shape hits you. You walk out into the massive space in what would have been the middle of the arena. It’s difficult not to imagine yourself as a Gladiator (as I often do…. ), entering to wild cheers and boos and then spending the last few minutes of your miserable life being gored by some massive animal. However, if you’re going to die this way, it is quite a pretty setting tbf. These days you can simply walk right through the piazza without being chased by a demented, hungry beast. You can plonk yourself down at a table in one of the many pretty outdoor cafes that encircle the space. We grabbed a table at a little deli, ordered some bruschetta and coffee and basked in the early morning sunshine. It’s a great location for a spot or people watching. The number of selfies and stereographs taken while we were there meant we also had to join in. I felt like *not* taking part would be tantamount to visiting the Leaning Tower and not doing that mad thing where you pretend you’re holding it up. And, yes. I totally did that too, obviously. Comprising glorious gardens and an exquisite palace, you can choose to purchase a combined ticket for entry to both, or individual tickets if you only have time to see one part of the attraction. Or, if the sun is so warm and lovely that you don’t want to spend a single minute indoors. The gardens are slightly smaller than I’d initially expected but are immaculate throughout. The perfectly manicured lawns of the courtyard are interspersed with statues of the four seasons (amongst others). These surround a central fountain that looks like it would be great for cooling off in. Everything in the gardens is perfectly symmetrical, and this looks best when viewed from the top floor of the palace. The riot of colours and different species of plants and flowers means there’s always something blooming. We spotted a host of roses, begonias, camellias, and the freshest smelling lemon trees. It is, quite simply, a fantastic and peaceful space. We visited in June, and it was very quiet, but won’t be so peaceful in peak season. Have you visited Lucca? What were your favourite sights? Lucca has been one of the places I’ve wanted to go in Italy. Thank you for renewing my excitement. Hoping next year I get to finally go! !